Dr. Ganzorig Gonchigsumlaa, originally from Mongolia, studied at the University of Manchester, where he obtained a Master of Science in Environmental Economics in 2010. He gained his PhD in Agricultural Economics at the Georg-August University of Goettingen, Germany in 2016. Since then, he has become a Senior Lecturer at the Mongolian University of Life Sciences where he teaches three courses: Introduction to Economics, Cost-Benefit Analysis and Development Economics. In addition, he also has experience working with the UN System and the Mongolian government. During the weeks of 8 September to 10 November 2017, PAGE delivered an e-learning course on green fiscal reform to meet the learning needs and build capacities of national stakeholders. "The GFR e-course was amazingly well-prepared and organized. The course plan, evaluation methods, training materials, online discussions and receiving feedback for my submitted assignments was fantastic. It was my first time taking an e-course, and I understand better now how useful it can be to take an e-course." In terms of content, Ganzorig says he "gained knowledge related to fiscal and financial aspects of the green economy for a variety of economic sectors including agriculture and transportation." The most important aspect of the course for him was the "chance to pool out every aspect of green fiscal reform with very practical international case studies and examples." Among all the new concepts that he learned, one of the key takeaways is that a biggest challenge to fulfill country goals might be the financial gaps, and thanks to the e-course, he grasped this more clearly. He encourages people who want to learn about GFR in a constructive manner to take the e-course. "The flexibility of taking the course at my pace, reading the training materials, and having homework was a good balance for me. The live discussions through the webinar was also very interesting and essentially allowed me to connect with other participants and talk about the same topic regardless of our geographical locations," he adds. 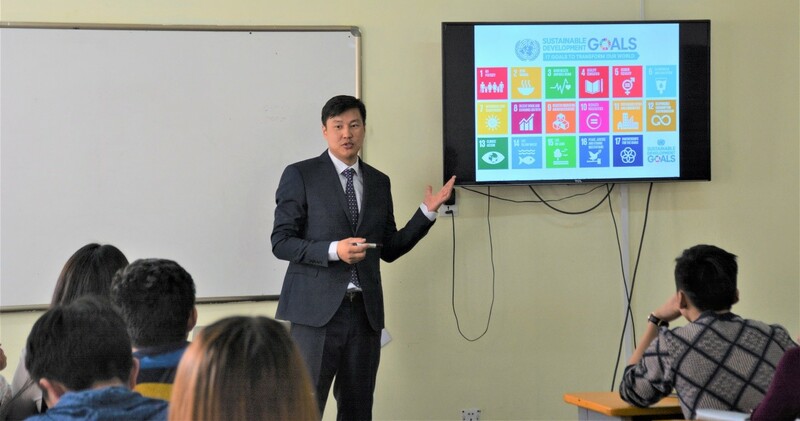 After taking the course, Ganzorig had a chance to share his knowledge through PAGE at UN Mongolia to develop a course on Green Economy and Modelling among the undergraduate students. The team of professors at the Mongolian University of Life Sciences, National University of Mongolia, and the University of Finance and Economics in Mongolia developed the course curriculum, and lecture and seminar materials. "I was in charge of the topics on Green Fiscal Reform: Rationale and related concepts and Green Fiscal Reform: Instruments. The two topics are translated versions of the Module 1 and 2 of the GFR e-course; in addition to, a few more cases focused on the context of Mongolia. This is evidence that the course was beneficial to the participants, like myself, who can later evolve the concepts to reach more people," he concludes. What do you think is the most popular course among architecture students at the Mongolian University of Science and Technology (MUST)? It’s a course on green buildings. “Even former students are asking us if they can take the course,” says B. Munkhbayar, a Senior Lecturer at MUST. 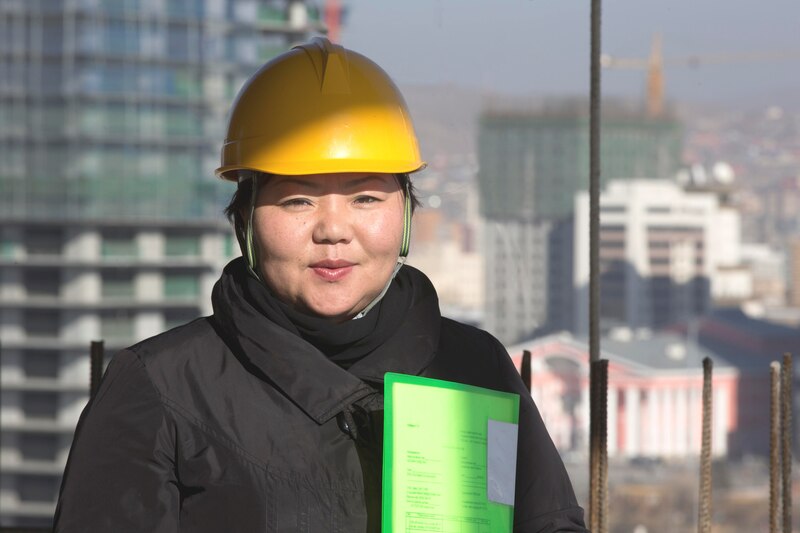 The interest in the course reflects a broader shift in the building sector in Mongolia where energy efficient buildings are more and more in demand. “Currently, the manufacturing and construction sectors consume 60 percent of total electricity and 24 percent of the heat. The building heat loss is about 30 percent – we want to change this,” says L. Batjargal, Director of Policy and Planning at the Ministry of Construction and Urban Development (MCUD). The National Green Development Policy sets a target for reducing heat loss through buildings by 20 percent by 2020 and by 40 percent by 2030. To achieve this, MCUD is working on a green building code and rating system and is revamping its construction sector policy, with support by PAGE, the International Finance Cooperation (IFC) and a Nationally Appropriate Mitigation Action (NAMA) project. A new morning for Mongolian cities? The Government is promoting more resource-efficient and inclusive urban development. Back to B. Munkhbayar and the education sector. The green building course offered by MUST is not the only green-economy related course run by Mongolian universities. With support from PAGE, the National University of Mongolia (NUM), the Mongolian University of Life Sciences (MULS) and the University of Finance and Economics (UFE) are developing a new undergraduate course on green economy and macro-economic modelling, to be launched in 2018. A new course on sustainable finance is planned to be piloted next year, in partnership with the Mongolian Sustainable Finance Association (MSFA), IFC and PAGE. 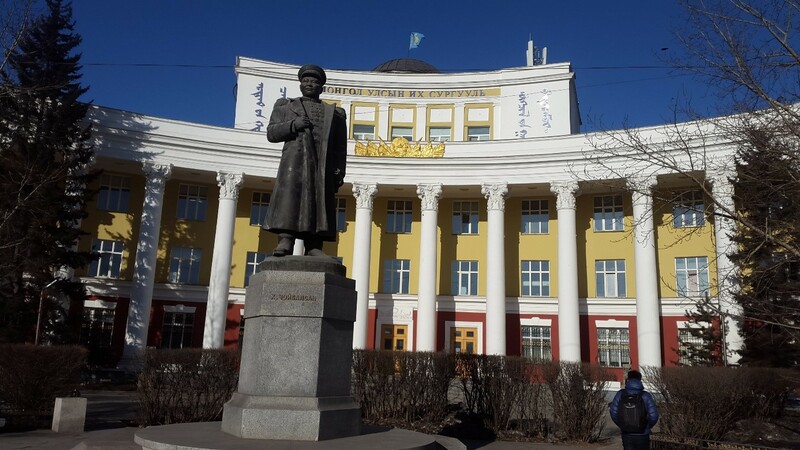 Mongolian universities are joining forces to green their operations and educational offer. “When I first came to Mongolia in 2015, the higher education sector was not yet much involved in the green and sustainable development agenda. There were a few initiatives but I think the momentum created over the past two to three years is quite remarkable,” says Amrei Horstbrink, a Green Development Specialist at the UN Institute for Training and Research (UNITAR). 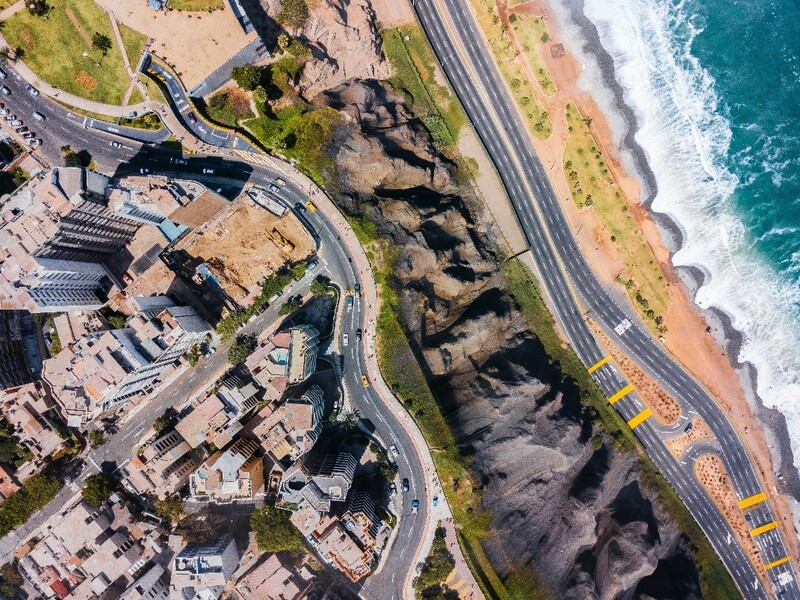 Beyond the launch of new courses, universities are joining forces to green their campuses and are planning to work on a submission to the Green Climate Fund (GCF). Furthermore, the Ministry of Education, Science, Culture and Sports is focusing the new higher education policy on sustainable development to encourage universities to green their teaching and operations. S. Munkhbat, Adviser to the Minister of Education, Science, Culture and Sports points out: “We are aiming to increase investments into higher education to contribute to a shift towards sustainable development”. 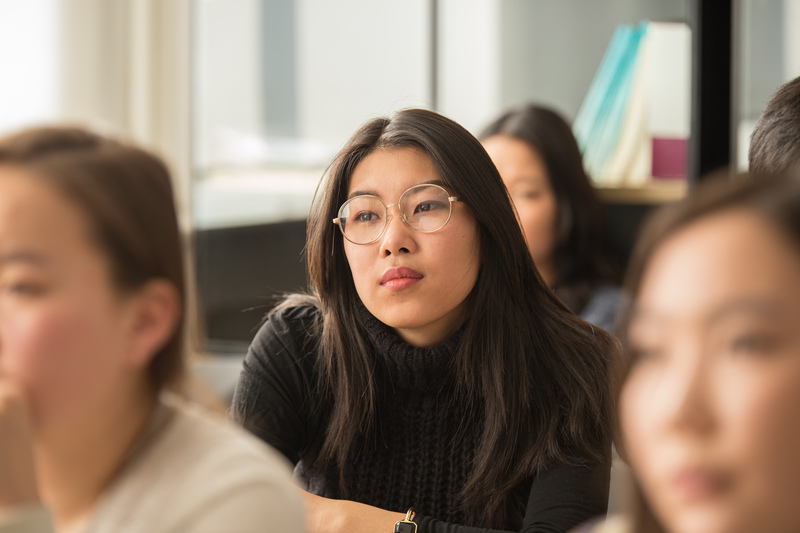 By greening their educational offer, the Mongolian universities are not only preparing their students to be better citizens but also to be competitive in a changing labor market. PAGE started its engagement in Mongolia in 2013, supporting the development of the National Green Development Policy which was approved by Parliament in 2014. Over the past four and a half years, PAGE has supported Mongolia in advancing its green development agenda with evidence-based policy appraisal using system dynamics modelling, analysis of different options for implementation of the NGDP, and support for policy development and reform in specific sectors and thematic areas, such as green construction, sustainable public procurement, green economy learning, sustainable finance, waste management and trade. In the week of 12 March 2018, a series of 10 meetings and workshops took place to advance technical work under the different thematic workstreams and to discuss with national and international partners how to ensure sustainability of the work supported by PAGE. 20 December 2017, Ulaanbaatar, Mongolia - Students from Lund University in Sweden and three Mongolian universities connected via video-conference on 20 December 2017 for a dialogue on how young people can contribute to an inclusive green economy. The students in Mongolia are from the National University of Mongolia, the University of Commerce and Business, the MB Park and GAIN. The Swedish students are part of the International Masters Programme in Environmental Studies and Sustainability Science (LUMES). The group discussed environmental issues Mongolia and Sweden are facing, as well as initiatives by students in both countries to advance green and sustainable development. For example, in the case of Lund, students managed to convince the university management to divest from fossil fuels and invest in renewable energies instead. 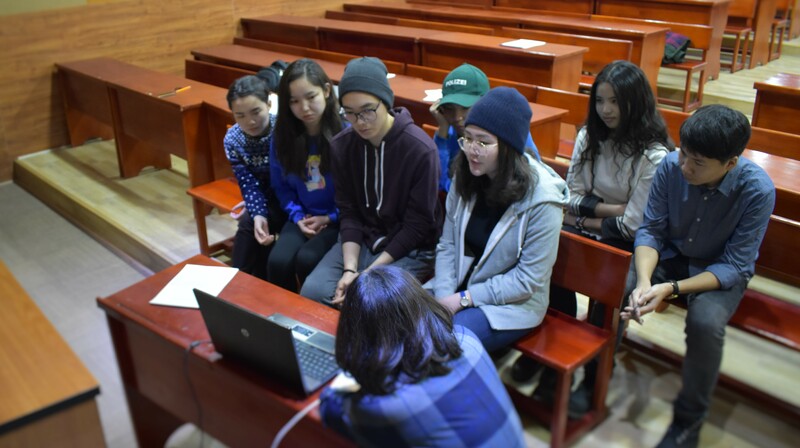 In the case of Mongolia, the students are likewise actively engaged in a series of initiatives, including a project that aims at transforming a former landfill. At the end of the dialogue, the students exchanged views on professional opportunities in the area of green and sustainable development. Both sides see growing job opportunities both in the public and private sectors. For example, in the case of Mongolia, more and more companies are hiring ‘ecology managers’ to green their production chains. 19 September 2017, Ulaanbaatar, Mongolia - There can be no question that Mongolia has international visibility and a reputation that far surpasses what might be expected from a country with a population of little over 3 million and a per capita national income of 3,800 dollars. It is remarkable, that is, until you actually visit for the first time. Mongolia is cold, it is vast in size and, not so long ago, inherited a Soviet industrial complex ill equipped for a more socially and environmentally conscious 21st century. With an economy that is largely based on the extractive industry it takes today about 17 kilos of natural resources to generate 1 dollar value in economic output. When compared to a global average closer to 2 kilos per dollar of economic output, this is incredibly wasteful. Yet the people are pragmatic and action oriented, mixed in with just the right amount of (justifiable) national pride. And so there hasn’t had to be too much debate about whether or not reforms are necessary. From the purchase of government paperclips, to the design of public buildings, to the diversification of its industries, Mongolia is going green. As part of a programme of support provided by the Partnership for Action on Green Economy (PAGE), the UN and its partners has been working with the government to think through what this ‘greening’ could mean in practice, so as to transform the economy towards greater modernity, sustainability and fairness for all. “He who wants to build high must dig deep” so the Mongolia proverb goes. Noone under-estimates the scale of the challenge and that it will require an unprecedented national effort. Everyone will have their part to play. Very much with this sentiment in mind, the great and the good in higher education recently met at an event, co-hosted by the Ministries of Environment and Education and the PAGE partnership, under a suitably large and resplendent banner that read “Mongolian Universities for Sustainable Development”. The hall was packed out right until the very end, when formal presentations gave way to active discussion on how to take action. Most significantly educators felt that all levels in the education system should teach the sustainability message, not just the higher levels. Green and pleasant campuses were seen as vital for the retention of knowledge and to promote behaviours conducive to learning. All agreed that national universities should work together on these issues through a national coordinating body that would facilitate creative ideas and the sharing of experience. As part of PAGE, the United Nations Institute for Training and Research (UNITAR) is proud to have been present at this event and to be working with the government and leading universities in considering how Mongolia’s education sector should play its part by preparing coming generations for a greener and fairer future. As an outsider one is struck both by the quality and maturity of the exchange; for here was a group of highly motivated, right thinking people who never for a moment question the idea that we all bear responsibility for our actions and that we are all fully accountable to future generations. No wonder Mongolia’s reputation precedes it. I’ll bet that by 2050 Mongolia will be one of the ‘go to’ places on the planet. 18 – 22 September 2017, Ulannbaatar, Mongolia - As the first country to join the PAGE partnership, Mongolia stands as a beacon for other nations wishing to pursue a green economic growth trajectory. Through the dedication of stakeholders across the economy, including government, private sector, academia and civil society, Mongolia has made significant progress in aligning national policies and targets with inclusive green economy principles, the Sustainable Development Goals, and the Paris Agreement on Climate Change. 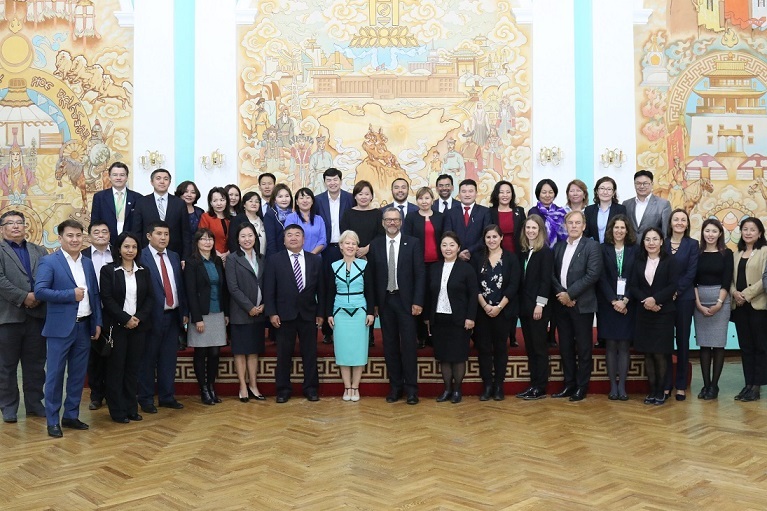 During the week of 18-22 September, the Government of Mongolia hosted a series of thematic events, meetings with national partners, and the PAGE Steering Committee Meeting – a biannual meeting of representatives from the PAGE Management Board and Funding Partners. The week highlighted the important role of a cross-sectoral approach towards green economy, and the significance of interministerial coordination towards a shared national green and sustainable development vision. A delegation from Kyrgyz Republic, which joined PAGE in 2016, participated in several events throughout the week in order to learn from Mongolia’s experience in green economy policy reform. The delegation, led by Green Economy Advisor to the Minister of Economy, Kylych Djakypov, will incorporate best practices and lessons learned from the PAGE programme in Mongolia into their planning for a green economy in Kyrgyz Republic. Mongolian News Agency Montsame captured key messages at a Press Conference held by the Ministry of Environment and Tourism. Watch the video here. At the Press Conference, Deputy Ministry of Environment and Tourism Ts. 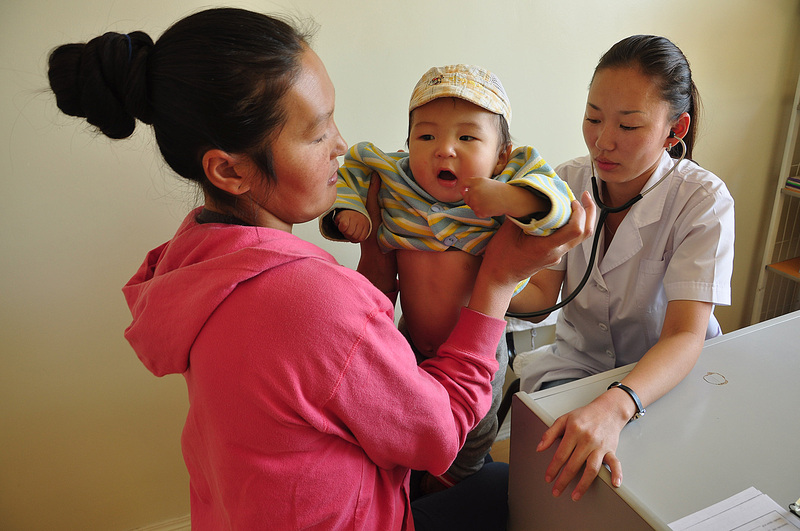 Batbayar highlighted findings of a Policy Brief prepared by PAGE on “Turning Challenges into Opportunities." The events received wide coverage in the Mongolian media. Please find a list of media coverage here. On 18 September, the Ministry of Finance hosted a Technical Meeting on “Sustainable Public Procurement (SPP): Actions and Future Plans," co-hosted by the Ministry of Environment and Tourism and PAGE. The technical meeting presented the ongoing work on SPP, including a proposed legal amendment, an Action Plan on SPP, and SPP tools, including standards, eco-labelling, life cycle analysis, among others. On 19 September, the National Development Agency hosted a “Stakeholders Roundtable on Harnessing Trade Opportunities in Transition to a Green Economy in Mongolia”, co-hosted by the Ministry of Environment and Tourism and PAGE. The Roundtable presented ongoing work in trade, including on identification of trade opportunities, agricultural development, export competitiveness, green production and green supply chains. Following the Roundtable on trade, the Ministry of Environment and Tourism and the Ministry of Education, Science, Culture and Sports hosted a partnership event “Mongolian Universities for Sustainable Development”. The event identified key actions to scale-up initiatives to strengthen the contribution of higher education to sustainable development. 130 policy makers, public officials, administrators, managers and lecturers of national universities, as well as students and student organizations participated in the event. In addition to these thematic events, the week also included a series of meetings with national partners Ministry of Environment and Tourism, Ministry of Finance, Ministry of Construction and Urban Development, the Economic Policy Competitiveness and Research Center, and a private bank, Golomt Bank, active in the Mongolian Bankers Association. Minister of Environment and Tourism D. Oyunkhorol affirmed her support for the green economy pathway in Mongolia, and noted that the PAGE partnership has been an important driver of inclusive and low-resource growth. Deputy Ministry of Finance Kh. Bulgantuya highlighted PAGE’s role in supporting interministerial coordination and evidence-based policy assessment. The Steering Committee Meeting was held over two afternoons on the 20-21 of September. The first session, held at the Ministry of Foreign Affairs, focused on Mongolia’s achievements thus far under PAGE. The second session, held at the UN offices in Ulaanbaatar, focused on planning for the PAGE programme in the coming year across the 13 PAGE partner countries and globally, and on refining PAGE operations and model for supporting a global transition to green economy. Throughout the week, Government and PAGE partners advanced planning for the sustainability of these initiatives and workstreams past the PAGE programme. Government ownership, collaboration with partners, and institutionalization of knowledge will ensure that Mongolia’s journey to green economy continues to advance. Mongolia remains a model for PAGE partner countries, as well as across the globe, for its impressive leadership towards a green and inclusive future. 14 September 2017, Ulannbaatar, Mongolia - Today, we are celebrating a milestone achievement in Mongolia’s journey toward sustainability. It is with great pride we announce the next step towards the launch of the Mongolia Green Credit Fund, a national financing vehicle that will provide long-term finance to projects and programs that stimulate green growth. The MGCF is led by the Mongolian Bankers Association, and holds the special distinction in Mongolia as our first green financing institution. Its establishment came after detailed action plans of a working group, which consulted with instrumental players within and outside Mongolia, including the United Nations Partnership for Action on Green Economy, UN Environment Financial Initiative, International Finance Corporation (IFC) and Global Green Growth Institute (GGGI). Today, we are excited that its core funding will be used to further sustainability in four green development areas that matter to Mongolia: energy, housing, waste management and sanitation. The Mongolian Ministry of Environment and Tourism authority will play oversight roles on the investment projects and programmes within the remit of the fund. The launch of the funds moves us closer to sustainable development, given the challenges identified in our transition to a green economy: “Mongolia has developed dramatically in the last two decades, but the economic side has excelled compared to its social and environmental development.” – Davaakhuu Tumurkhuu, Mongolia Bankers Association. Today, we are starting a process to unlock green financing at scale. The MGCF enables the development of bankable funding proposals to help Mongolia excel on the social and environmental fronts. In 2013, Mongolia became the first country to join a partnership of five UN agencies known as the Partnership for Action on Green Economy. As a result, Mongolia committed to place sustainability at the heart of its economic policies and then developed a Sustainable Development Vision in 2016, which among other objectives, commits Mongolia to reduce greenhouse gas emissions by 14% by 2030. With our current development plans, we are also placed to advance the 2030 Agenda, and achieve positive climate targets in the Paris Agreement. The MGCF now enables a key source of financing – reinforced by the Green Climate Fund – to support these sustainable development plans. Today, we reflect on our journey toward this launch announcement. The Mongolian Bankers Association organized the 1st Sustainable Finance Forum in 2013. The 2016 Forum on “Sustainable Development 2030: From Planning to Action” attracted 300 delegates from government, international organizations and the private sector. 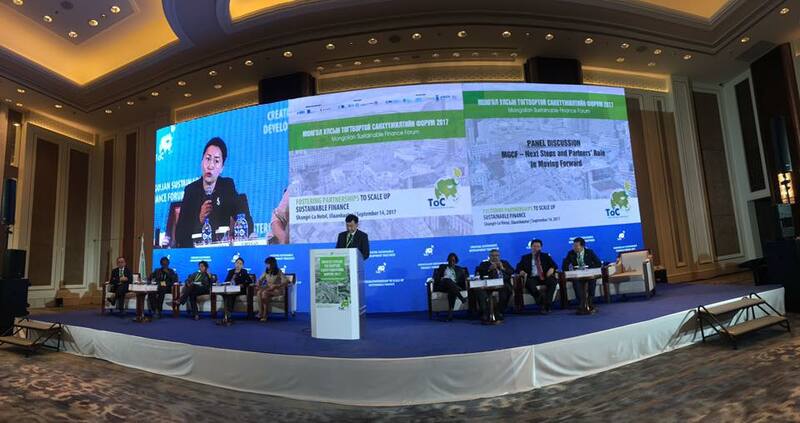 The forum resolved to advance the sustainable finance initiative, including through the establishment of the Mongolian Green Credit Fund together with the Prime Minister’s Office, the Ministry of Environment and Tourism, the Ministry of Finance and international partners - PAGE, IFC and GGGI. Today, we also recognize the 5th Mongolian Sustainable Finance Forum held on September 14, 2017 at Shangri-La Hotel in Ulaanbaatar, Mongolia. The Forum focused on the theme: “Fostering Partnerships to Scale Up Sustainable Finance”. Mr. Erik Solheim, Executive Director of UN Environment made the keynote speech, having paid an official visit at the invitation of the Government of Mongolia. The Forum was hosted by the Mongolian Bankers Association, in cooperation with Ministry of Environment and Tourism, Arig Bank, IFC, GGGI, BMZ, UN Environment, PAGE, UNDP-Biofin, the Ministry of Finance, the Bank of Mongolia, the Financial Regulatory Commission, Ulaanbaatar City Mayor's Office, and the Mongolian National Chamber of Commerce and Industry (MNCCI). Today, a Memorandum of Understanding was signed among the Ministry of Environment and Tourism, Ministry of Finance, Mongolian Bankers Association and Global Green Growth Institute on establishing the Green Credit Fund. The MoU aims to maximize financing with preferential conditions to the financial market, to reduce interest rate, to develop green investment methods, to efficiently use natural resources, to reduce air, environmental pollutions and greenhouse gas emission, and to boost environmentally friendly economic development. Today, we are assured the 5th Mongolian Sustainable Finance Forum has helped to accelerate momentum on the green economy. In his opening speech Mr. O. Orkhon, the President of Mongolian Bankers Association affirmed that the “United Nations is standing with us and supporting us." The Minister of Environment and Tourism Ms. D. Oyunkhorol highlighted that PAGE has provided continued support to Mongolia since the country joined PAGE in 2013 and took the opportunity to express her gratitude to Mr. Erik Solheim for UN’s full support through PAGE. She added that Mongolia has requested to UN Environment to join the BreatheLife campaign, an initiative by UN Environment and World Health Organization. At the Forum. Ms. Bulgantuya, the Vice-Minister of Finance confirmed that the Mongolian Government sees tremendous opportunity for the MGCF to mobilise private sector funding for sustainable development and believes in its future. She also highlighted the Government of Mongolia is considering the establishment of state-led Mongolian Green Development Fund that will oversee green projects and programmes to be funded through development financing as well as from the state budget and offer a source of support to the privately-led MGCF. Today’s announcement about the MGCF launch is a testament to the power of multiple, collaborative stakeholders to achieve results for Mongolia’s green development. 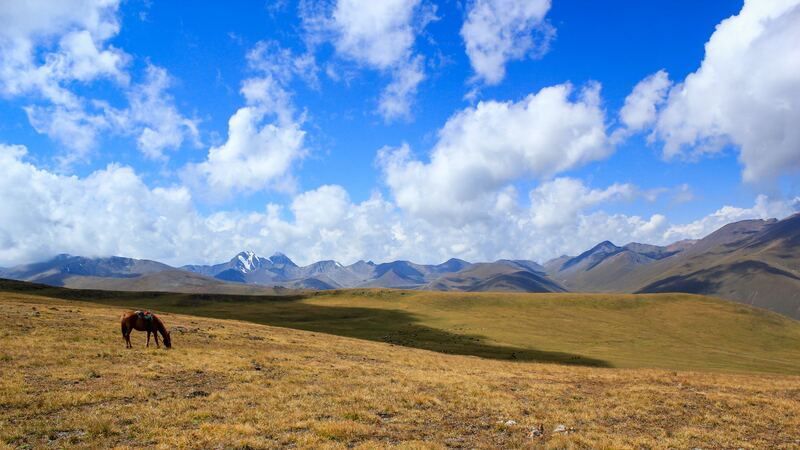 Today, we are more confident about Mongolia’s transition to a green future. PAGE supported establishment and operations of the joint working group, an assessment to determine the market demand for green lending on various projects and the Forum. This was led by the Mongolian Bankers Association. The results of the assessment gives us confidence about the future impact of the MGCF. Bankers have been discovering who wants green finance—and why. They also reviewed key legal, regulatory and tax structures, before developing the concept note for a green credit fund in Mongolia. The findings were presented to the Cabinet and support from the administration has been instrumental to steps leading to the launch of the Mongolia Green Credit Fund. Ulaanbaatar, Mongolia - PAGE, in collaboration with the Ministry of Environment and Tourism of Mongolia and the National Development Agency organized a two-day training on “Green economy, sustainable production and trade opportunities” on 29-30 May 2017 in Ulaanbaatar. The training brought together more than 60 participants from government ministries, the private sector, higher education, and civil society. The training was divided into 5 sessions with focuses on the 2030 agenda for Sustainable Development, nexuses between trade, environment and sustainable development, agricultural value chains and trade, frameworks for trade, and international best practices. Within these sessions, the topics discussed ranged from green trade concepts, eco labelling, organic agriculture, sustainability standards, and eco-tourism to how to best devise regional trade agreements and create market access opportunities for developing countries. In addition to UN Environment, the International Trade Centre (ITC) and the United Nations Conference on Trade and Development (UNCTAD) also joined the training where they presented their knowledge on products and databases relating to sustainable trade. Participants were then divided into five groups for in-depth discussions on trade opportunities arising from organic agriculture, eco-tourism, renewable energy, and livestock products, and had the opportunity to discuss their ideas on the export potential of products such as meat and milk, hides and leather, wool, cashmere and knitted garments. The training was followed by an experts’ workshop on “Sustainable Development and Trade Opportunities for Mongolia”, bringing together nearly 100 participants from government ministries, National Meat Producers Association, Dairy Product Association, Tourism Association, as well as companies and local producers. At this time, the Vice Minister of Environment and Tourism Mr. Ts. Batbayar delivered an opening address that highlighted green trade opportunities in Mongolia driven by the “Industrialization” Strategy, “Mongolian Export” Initiative and “Mongol Branding” programme, as well as ongoing and potential trade agreements with key trading partners. The training and workshop kick started the new PAGE project on “Harnessing Trade Opportunities in Transition to A Green Economy in Mongolia” in an effort to develop a Mongolian green trade policy. Jointly implemented by the Environment and Trade Hub of UN Environment, the Ministry of Environment and Tourism and the National Development Agency, this project aims to improve the knowledge and capacity of the country to identify and harness green trade opportunities and to also support and complement Mongolia’s efforts to implement the 2030 Agenda and national development policies. Inputs gathered from this workshop will be incorporated into a stocktaking study of Green Trade opportunities and challenges in Mongolia with concrete policy recommendations for future development. Looking to the future, the government of Mongolia will continue to build its trade policy, which can help the country move closer to a green economy. In 2016, the newly formed government developed its Action Program to be implemented for the period of 2016-2020 with a main objective to revitalize the economy within a short period of time, promote growth, support social sectors, and increase the income of the exports of non-mining sectors and diversify the economy. Since export programme is currently being developed by the Ministry of Foreign Affairs of Mongolia and the National Development Agency, PAGE's new trade workshops can help provide Mongolia with additional training and expertise on green trade to inform these new policies.